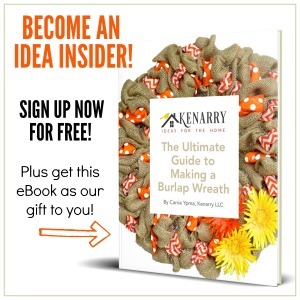 Greetings Kenarry readers! 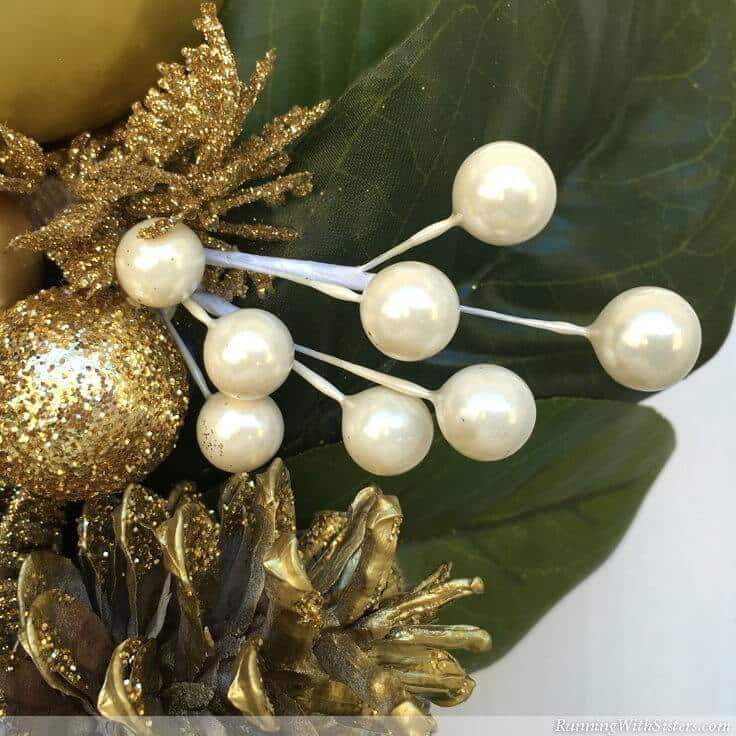 We are Jennifer and Kitty from Running With Sisters, and we have a wonderful holiday project to share: A Magnolia and Glittered Pinecone Wreath! 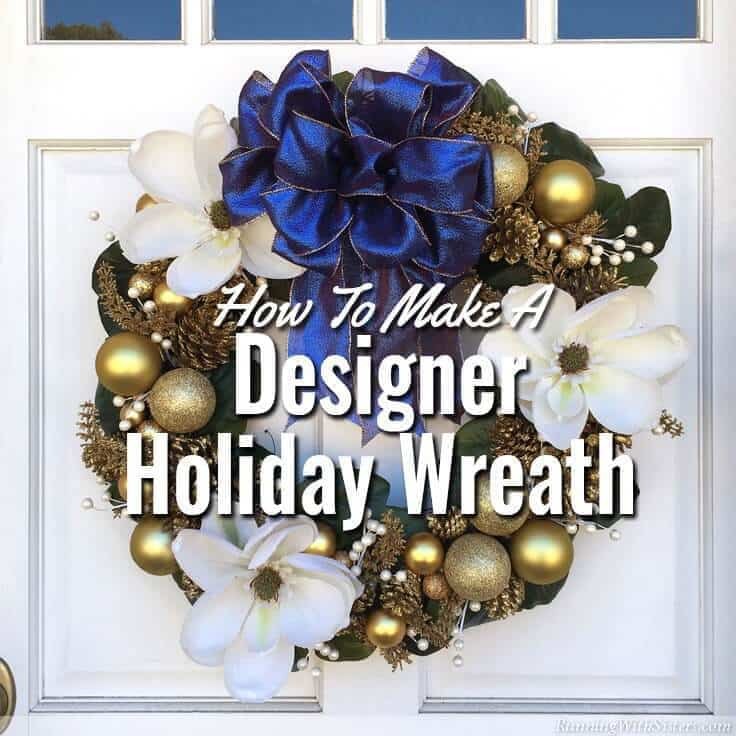 We love making wreaths – for every season and holiday! And we’ve learned some great tips and tricks along the way. 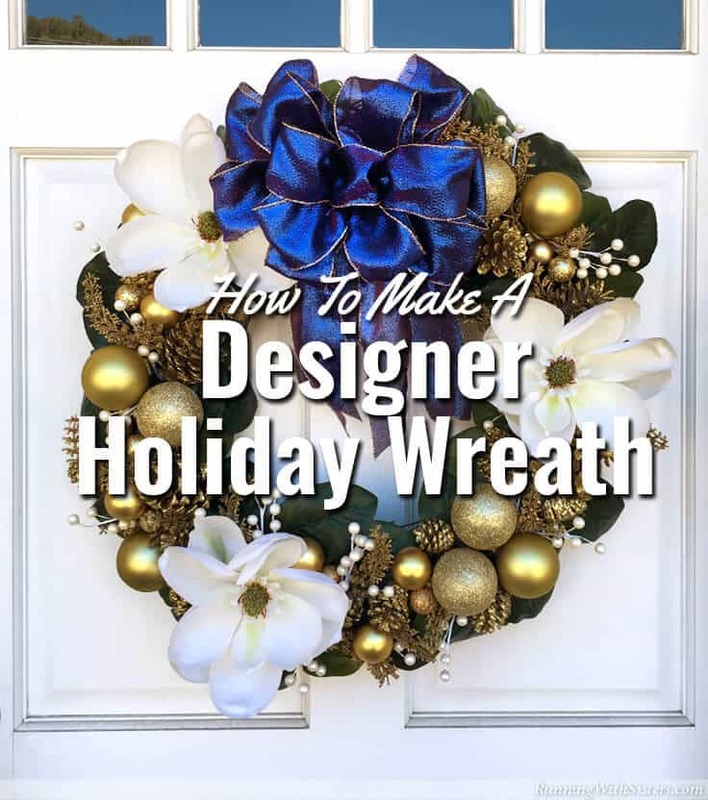 One of our best tips for a wreath like this is to use at least three different sized decorations: something big and beautiful to be the star of the show, something medium sized to fill in the gaps, and something smaller to knit it all together. 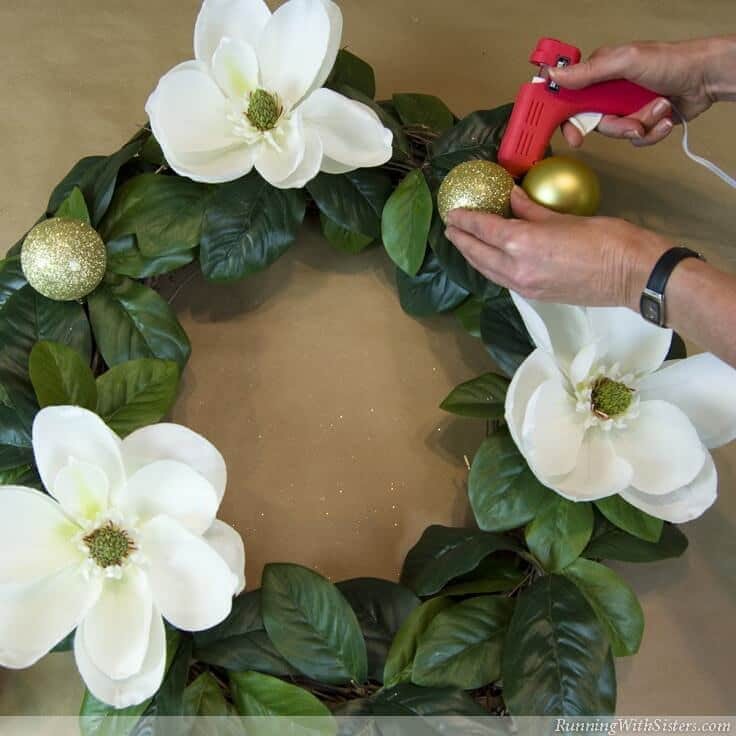 So when we saw these gorgeous magnolias, we knew they were meant to be the stars of our latest holiday wreath! Christmas is the perfect time to go big, go glittery, and get dramatic! And we love to finish a wreath with a big, loopy bow. We even made a little video to show you how we make our bows big and loopy! Before we started assembling our wreath, we prepped the materials that needed painting and glittering (that way everything was ready to go!). So we started by spray-painting the pinecones gold. (We recommend brushing off any dirt first.) Then we glittered the tips. To do this, we made a five-to-one mixture of water and white glue. We painted it onto the tips of the pinecones and then sprinkled generously with the gold glitter. You should let your glittered pinecones fully dry before you start making your wreath. Next we created a bed of leaves as a backdrop for the magnolias, pinecones, and ornaments. 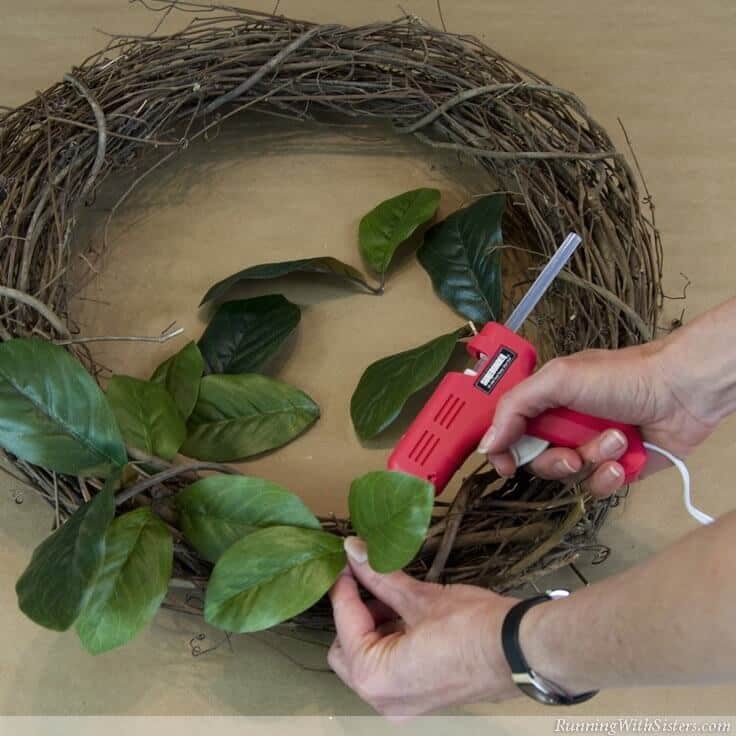 We snipped the leaves off two long magnolia garlands, then we glued them individually onto the grapevine wreath with hot glue. 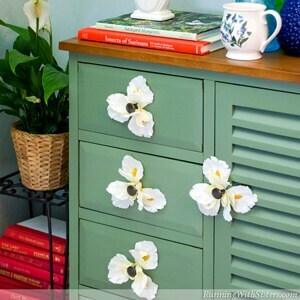 We like to cluster the leaves into overlapping flower shapes to make it look more natural. The biggest stuff goes on next and in this case, that’s the magnolias. We evenly spaced the flowers and hot glued them to the wreath right on top of the leaves. Then we added the largest ball ornaments, some clustered together and some alone. They went into the spaces between the magnolias. Some people like to add the bow last, but we think it needs to go on with the other big stuff. That way you can tuck the smaller decorations in and around it. For a dramatic wreath like this, we like a big, loopy bow! We attached the bow to the top of the wreath so the tails would hang into the center and fill up that open space. If you’ve never made a big bow like this, here’s a video showing how we like to make them. It’s easier than you think! Next we added the glittered pinecones. We tucked them into the spaces created by clustered ornaments, and we glued them poking out from under the magnolia petals. 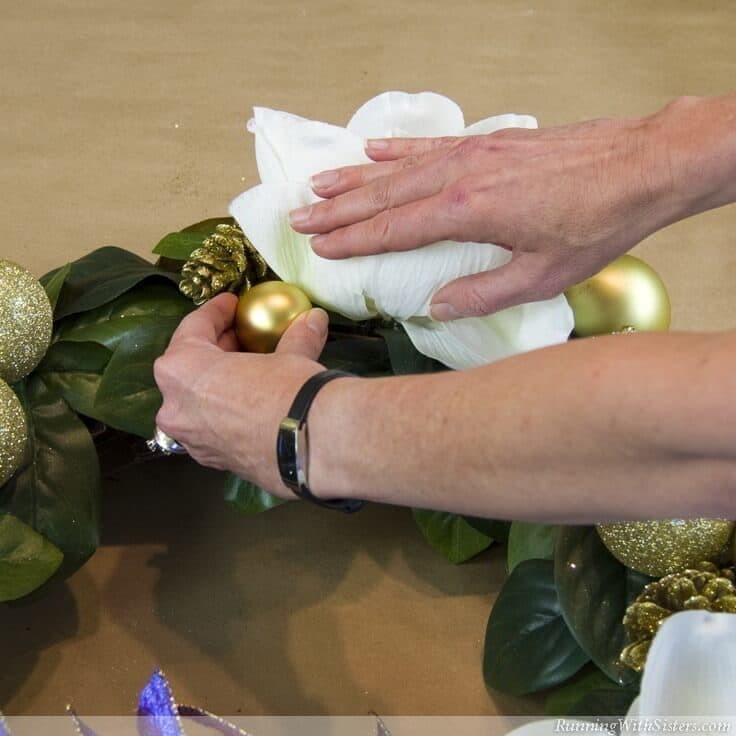 By decorating the wreath with the biggest items first, you create obvious spaces to add the next smaller items. 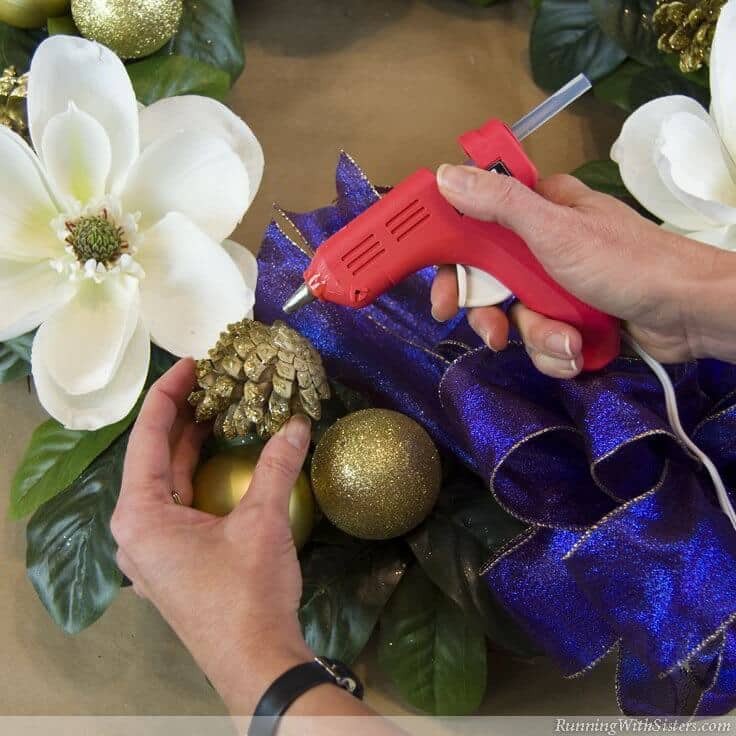 Your wreath will have clear openings that are perfect for your pinecones. Then we started filling in with smaller ornaments. 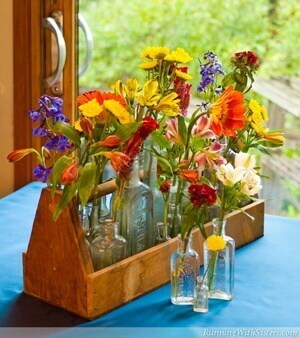 This step helps cover any bare spots and fill in smaller gaps. We used matte and glittered ball ornaments, so we made sure to spread them out and not have too many that were the same in the same spot. Lastly, we added berry picks and fir sprays. Our berry picks came with lots of branches on a stem. So we cut them apart into smaller picks and just glued them all the way around the wreath. We tucked them into ornament clusters and under the pinecones and magnolias. We did the same with our gold fir sprigs. (The fir sprigs were a dollar store find!) We cut them apart and hot glued them in and around the items already on the wreath. We use this same process to make all our wreaths, although the Christmas ones are always the most glamorous! Still, we always start with a background like leaves, then add the goodies from the biggest to the smallest. And we finish with picks and sprays. Once you try it, you’ll be shopping the floral section at the craft store looking for superstars to inspire your next wreath. Let us know how it goes! 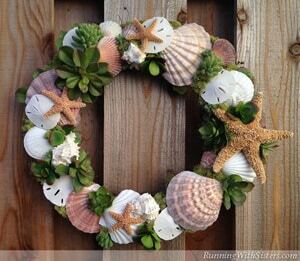 Do you have a special way of making wreaths you love? 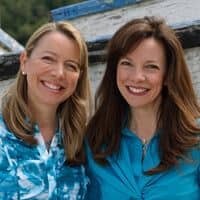 Have any tips or tricks to share? We’d all love to hear them. Let us know in the comments below!